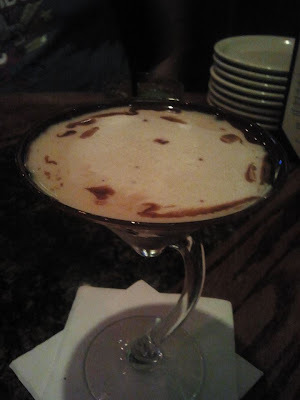 When you tire of the redundancy of Olive Garden and Romano's, and don't have to pacify the kids' cravings for low-quality, fast food style pizza, you can discover true Italian magnificence at Delmonico's Italian Steakhouse. 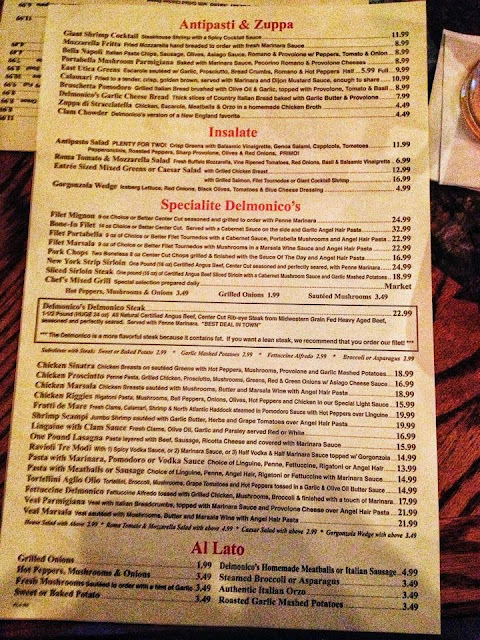 There are six Delmonico's locations, and only one outside of New York. Yes - Orlando is just that cool! The Orlando Delmonico's is off the I-Drive tourist strip near the general Sea World area. Outdoor and indoor seating options are available. During the non-hellheat months, the outdoor section would be a stellar choice, with candles and linen tablecloths donning the tables, that are fairly spaced for an enjoyable, non-claustrophobic dining experience. However, if you don't make it indoors, you will be missing Delmonico's creative décor, and that would truly be a shame. 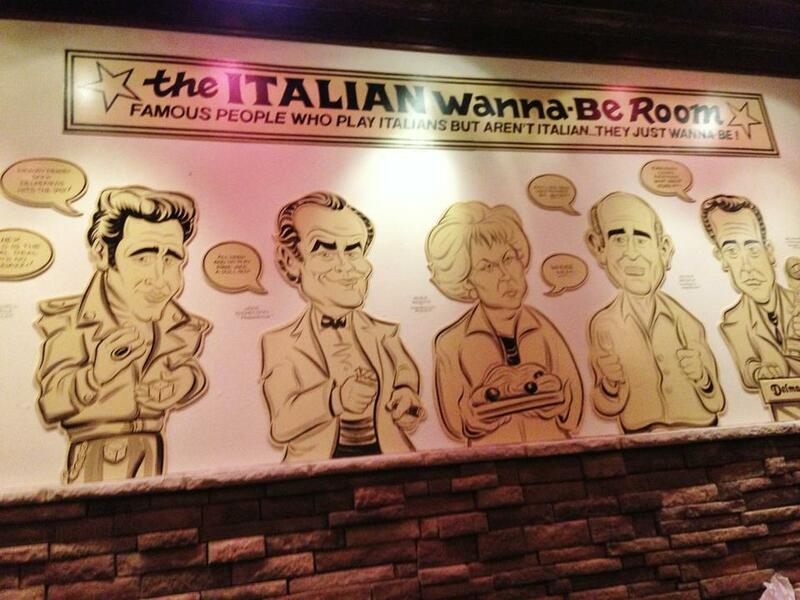 The walls are tastefully covered in larger-than-life, impressive caricatures of famous personalities who share witty word bubble wonders with the diners surrounding them. 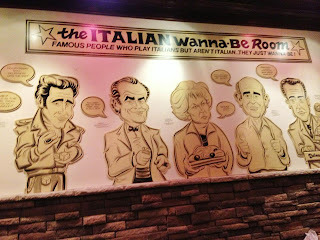 Being that I am only Italian by marriage, I had to have special appreciation for the "Italian Wanna-Be Room". (Great Nicholson, by the way!) Well dressed staff, nice lighting, ample space and generally just an appealing atmosphere as a whole inside Delmonico's! Considering that I was kid AND monkey free on this night, it was ALL about the adults. Naturally, this scenario made the Godiva Chocolate Martini overwhelmingly appealing, so I dove right in. This cocktail was such a gift to my taste buds that a second one was definitely in order. Watch out for this one - You just may forget that it can pack a punch! Very well made, yummy and pretty to boot! Now, feast your eyes on this menu! I know... not so lady-like. In fairness, this meal lasted me through three sittings! Gotta love leftovers, right? 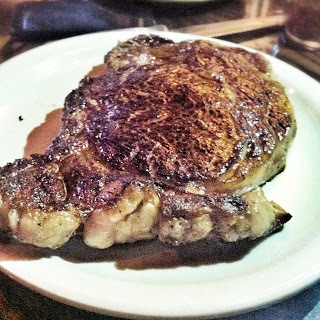 All I can say about the Delmonico steak is WOW! They do warn you that this is a fatty cut of meat, but yes, that's where the flavor comes from. The side of penne was practically unnecessary - any steak that gets a plate all its own is a meal in itself. Flavorful, juicy, savory and quick to arrive = success in my book! Needless to say, I did not have room left for dessert, but I saw a slice of cheesecake fly by our table that easily could've fed a small family of non-Italians as a whole cake itself!! If it weren't for the fact that I drank my dessert, I would have absolutely found a second stomach to store that in! Overall... 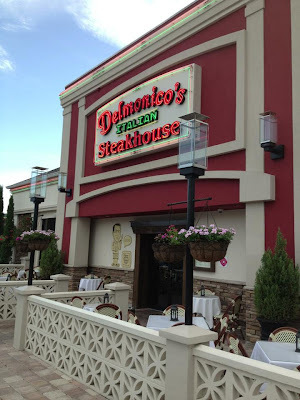 I'm anxious for my next Delmonico's experience, and we're already making plans to take the family next time they come to town. If it passes our test to be intro'd to the rest of our Italian relations, it's GOTTA be good! Still, I can't help but it wonder... it's probably even better in New York, right?